The world’s biggest social networking site, Facebook has launched a slimmed-down version for people with slow Internet connections. Facebook Lite will be faster and simpler as it offers much fewer basic services than the main site. The options on Facebook Lite allow the users to just write on their wall, post photos and videos, view events and browse other people’s profiles. There are no apps or special boxes that consume too much bandwidth. The Lite version is aimed to work like wonder for people to just stay connected with this popular medium, eliminating the problems of poor network connections. The simple site loads quite fast and is easier to navigate. The eye-candy is definitely reduced, but it still looks great and is easier on the eyes. Anyone who switches to Facebook Lite and does not like it or wants to use the apps, one can switch back to the fuller version of the site at anytime. It is only available in India and the US as of now, though it is meant for the developing countries featuring inferior infrastructure. The firm said that it is working on translating Lite into other languages and we can look for worldwide release pretty soon. 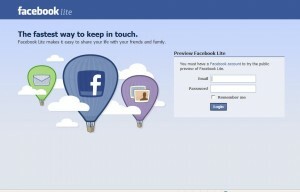 Facebook added it plans to introduce some more features to Facebook Lite later and asked users for their reactions. “We still have work to do before it’s done, but we’d love to get your feedback on what we’ve built so far,” Facebook said. This move by Facebook is seen as a big move by the firm to position itself as a one-stop site for social networking, blogging, and search, perhaps even taking on greats like Google.